My hostess, Mindy Celeste, thought I was a bit crazy to go out in 14°F weather this morning just to see what I could see, and so did I. But it was sunny and beautiful, and there was no guarantee the sun would stay out, so off I went with layers and a heat pack for my gloves. It turned out to be a good decision. After a couple minutes I stopped to watch a couple of cawing crows, but as I am wont to do, looked over my shoulder to make sure I wasn’t missing anything cool in the opposite direction. And what do I see a hundred yards away but a thing-that-could-be-a-really-large-cat-or-could-be-a-fox. 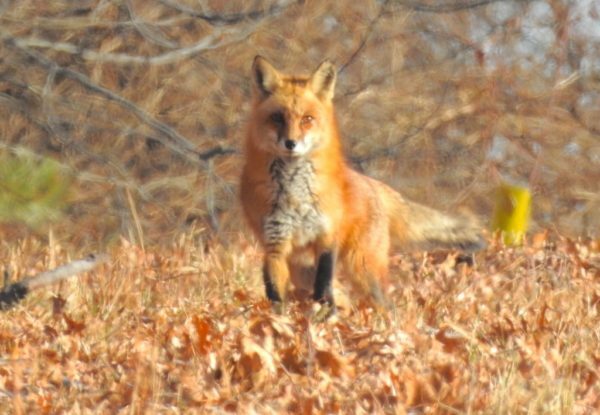 It turned out to be a red fox. This is the third fox I’ve seen on my visit to Reston. I saw the first one on the day after Christmas, but only for about a second as it darted across the path fifty or so yards ahead of me. 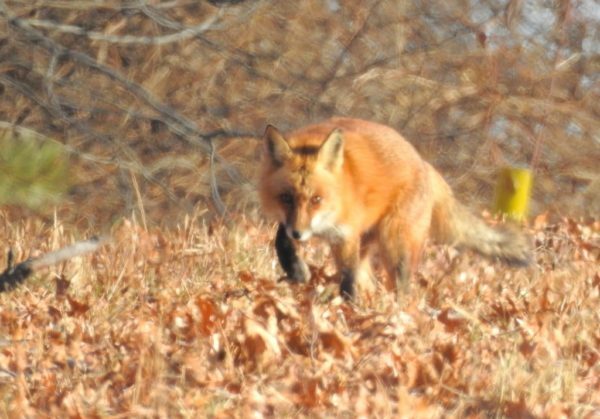 >> Enjoy more Reston wildlife posts. The second one was yesterday when I was deeper in the woods. I’d been standing quietly at the edge of a creek for a while when I noticed movement about fifteen feet to my right. 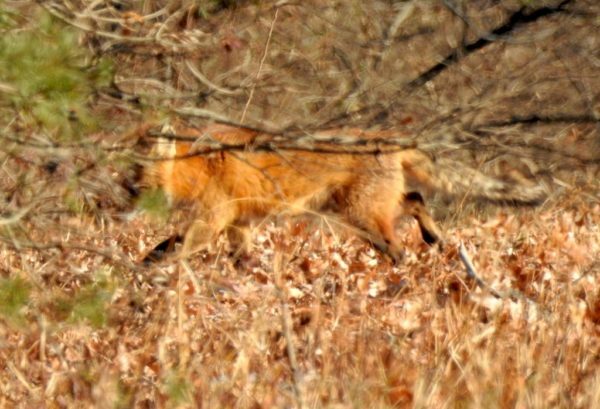 Alas, my camera was in its bag, and by the time I got it out, the fox had already had time to be startled by my presence and start moving away. I could still see it, but couldn’t get the camera to focus past the brambles it was moving behind. Soon, it was behind a log, then a hillock, and the next time I saw it, it was almost a hundred yards away in the underbrush. Then it disappeared. 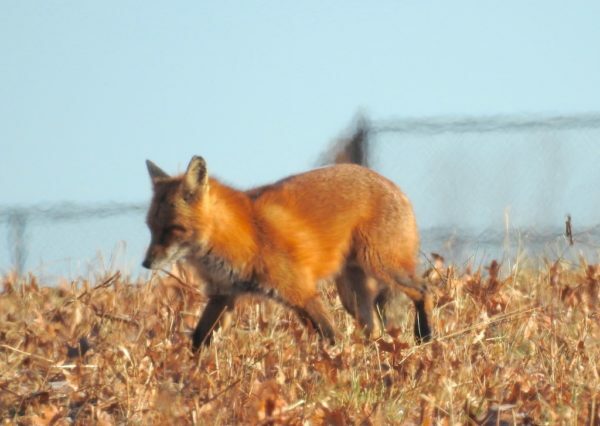 Still, these are more fox sightings than I get back in Madison. Who knows? I might get to take more pictures of foxes before I leave. 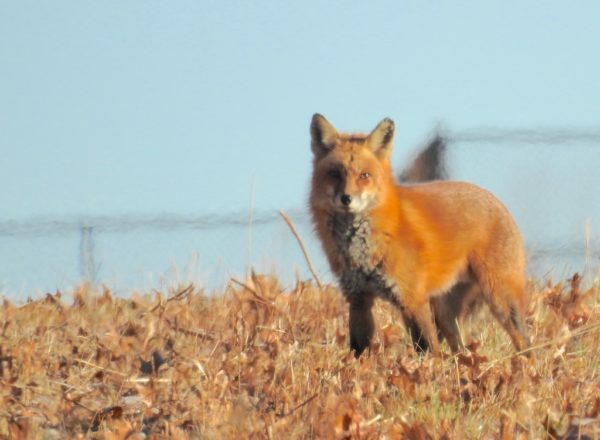 Did you know there are 45 subspecies of red fox? 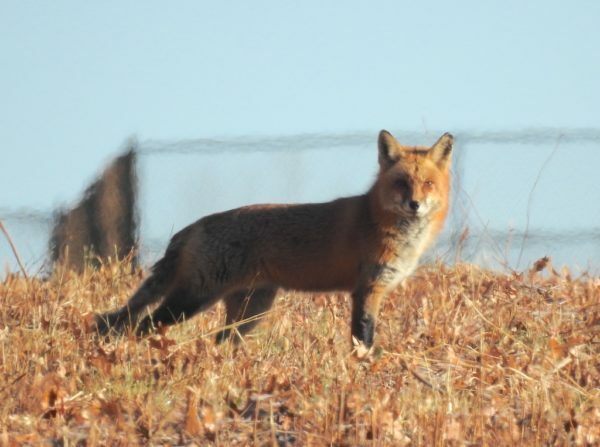 You can read all about it in my post Critter of the Day: Red fox (Vulpes vulpes).